During the 12 years we had our summer studio in Sète we found it difficult to find really good restaurants. Most restaurants focus on one time customers during the summer and the prize tends to be more important than quality. We however found a few good places which we return to time after time. One of our absolute favorites is the Vietnamese restaurant Le Jasmin. The food is excellent and the service could not be better. The owner makes you really feel like you were an old friend and treated you like one. If you are used to Asian food from China this is something quite different with lots of flavors and, if you choose so, quite spicy. The restaurant is quite small so you have to reserve a table even in low season as the place is popular. Unfortunately we do not visit Sète that often nowadays, but as often as possible we return to Le Jasmin. We did visit Le Jasmin a couple of days ago with friends and we were happy to see that the quality is still as good as ever and the reception from the owner is like you we were old friends. Revisited for friend´s birthday in 2013: As always a very pleasant experience an boring as we are we had our favorite dishes and a good chat with the owner. The restaurant was packed as always. Revision 2015: Friends that have been client for decades report that service and food is not as good as it used to be due to new co-owner. Visit September 2015: Back to normal again. We had a very good lunch. Visit New Years Eve 2015: Excellent food and the service is like coming to a good friend's place. This restaurant is one of our big secrets. It is not possible to find if you do not know about it. It is located on the very boring coast road outside Frontignan on the road to Montpellier. You find it in the middle of an industrial area and you would pass it without even a glance if you do not have eyes like a hawk and can see all the awards from every gourmet guide in France that is put up on the front door. The place is an old fashioned restaurant with very correct old fashioned service and absolutely fantastic old fashioned food. I am talking of the hotel and restaurant Hôtellerie de Balajan. We have been there twice and the latest time we had a birthday party with our friends. Everything you get on your plate is better than you expected. The only problem might be that you get a little to full; especially the grand cheese trolley and the grand desert in the end could be too much for anyone. The good news in the end is that the prize is very reasonable. On top of everything one of the ladies got a loaf of their homemade bread as she said she liked it. In the new galleria Polygon in Beziers there are quite a few ethnic restaurants up on the terrace. 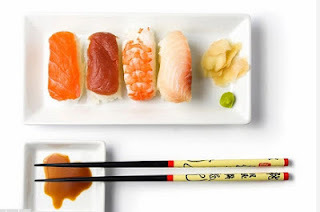 We have tried a couple but our favorite is the Japanese Sushi place named Tokyo. They have traditional sushi and sashimi but also very nice skewers. The place is pleasant and the service good. It is a nice break to the French food we mostly eat. We just happened to end up in Le Côté Pub one day and it was a very nice experience. It is a kind of yuppie place with very good food. We only tried one of their salads, but that was impressing. I have never seen a salad that big and with so many exclusive things in it. I was totally full and still it could hardly be seen that I had eaten. If you go there – share! We were sitting outside, but the inside is very modern and stylish. The service is very nice even to old-timers like us. I think we must have been the oldest in the restaurant. Everybody looked very busy and professional. We liked the place though and were impressed by the food we saw being served at the other tables. This is not a regular eating place. It is a number of small restaurants, some just a few tables that are housed inside the large Halles de Narbonne. You find everything from the simplest places where you sit on stools at the counter to places with a few restaurant tables. They all benefit from the fact that they are in the middle of a food temple. Do not be surprised if your order of a steak is followed by the waiter yelling to the butcher across the aisle, who immediately cuts out your piece, wraps it in paper and throws it in the air to the chef who catches it an puts it on the stove. The selection of wine is almost infinite and if you are not very hungry there are many places that serve just wine but you can order a plate of small things from the surrounding food stands. You must however be there in time – they close just after lunch and it is mostly absolutely packed in the small eating places at lunch time. Revisit September 2012: A couple of times we have visited La Bodega des Halles. They are specialized in Spanish ham of high quality accompanied with delicious olive oil and a good selection of local wine. The place is very simple and very friendly. For 33 euros the three of us had one portion of the most expensive Pata Negra - Bellote, a portion of Serrano, wine, bread, oil an coffee (the coffee was on the house). You do not need a portion of your own, but if you want anything else than ham they have other things, like cheese. This is one of the places you can sample the best wines of the area by the glass at a small price. Revisited latest time Mars 2014: We go here regularly all year with friends or by ourselves and it is always very nice and we always try a new wine they recommend to us. Revisited May 2013: Another interesting place for eating is Chez Bebelle that is quite famous from TV. It is owned by a former rugby star that uses his skills when he catches the meat thrown by the butcher across the isle. Revisited La Bodega: Fabulous as always! 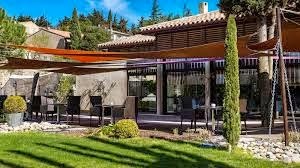 If you are new to French food and would like to take a grand tour through everything on a French table or if you are a big eater you should go to Le Grands Buffets in L’Espace de Liberte in Narbonne. It is also a great place to take guests to explore the French cuisine. For less than 30 euros you can eat as much as you like of everything of every French specialty. There is seafood, ham, foie gras, charcuteries and a lot of other things as starters, there is a grill with everything from frog legs to meat of all sorts, there is hot and cold dishes, salads, cheese and in the end a desert table with hundreds of different things to taste. You can buy wine by the glass and in bottles of the most famous wines from the area and they do not add anything on the prize. They charge you the same as you would pay at the vineyard. This means you can order a glass of wine that you would normally think is to expensive. If you like a wine you can buy a bottle or a whole case and bring home. The service is efficient and nice and used plates vanish from your table as you pick up new food from the buffet. You must take your time and eat slowly at this place. It is a good idea to reserve a table because this is a very popular place. The restaurant is very nice but quite big. There is a play-room for children if they think their parents get stuck with eating too long. The strange thing is that the restaurant is housed within a sport center with a view over the swimming pool. Revisited 2013: The restaurant has got a new owner and has gone from interesting and good in its kind, to excellent. The idea is the same - you eat as much as you like of typical French dishes and you can try most of the best wines of the region to the same price as at the vine-yard. It is served in bottle or by the glass. The differences from before are all to the better. The selection of wine is much larger and today you can afford to try a glass of wine that you probably never would do at any other place. For people who like too sample some of the worlds most fantastic wines at one place, this is the right place. It is quite possible for our economy to by a glass of wine that cost over 1200 euros per bottle and pay a little over 10 euros for a glass. I do not know any other restaurant that would give you that opportunity. The selection of hot dishes are also much larger and more interesting and the cheese table that before was a bit poor is now fantastic. As before - the selection of desserts and starters are formidable. Revisited February 2018: It has improved very much since we visited it last time. You might be looking for something very genuine, both in terms of atmosphere, food and service. 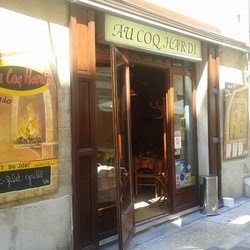 Restaurant Au Coq Hardi is just the place to go. It is located on the ancient Via Domitia in the center of Narbonne. The restaurant is warm and welcoming and quite small. The food is traditional, big pieces of entrecote, confit de canard, grilled fish and all the traditional starters and desserts you have heard of. They serve wine from local producers of high quality to reasonable prizes and the service make you feel that you are coming home to somebody. You can compose your own meal by choosing two or free courses from the a la carte menu to fixed price. Revisited January 2014: We have not been here for a while - there have been so many restaurants to explore. We immediately felt very welcome and it felt like yesterday. As always, the food was wonderful and the service very welcoming. Revisited April 2014: Very good as usual. Revisited 2017: They have got new owner and new chef. The special charm with this traditional French restaurant is gone. 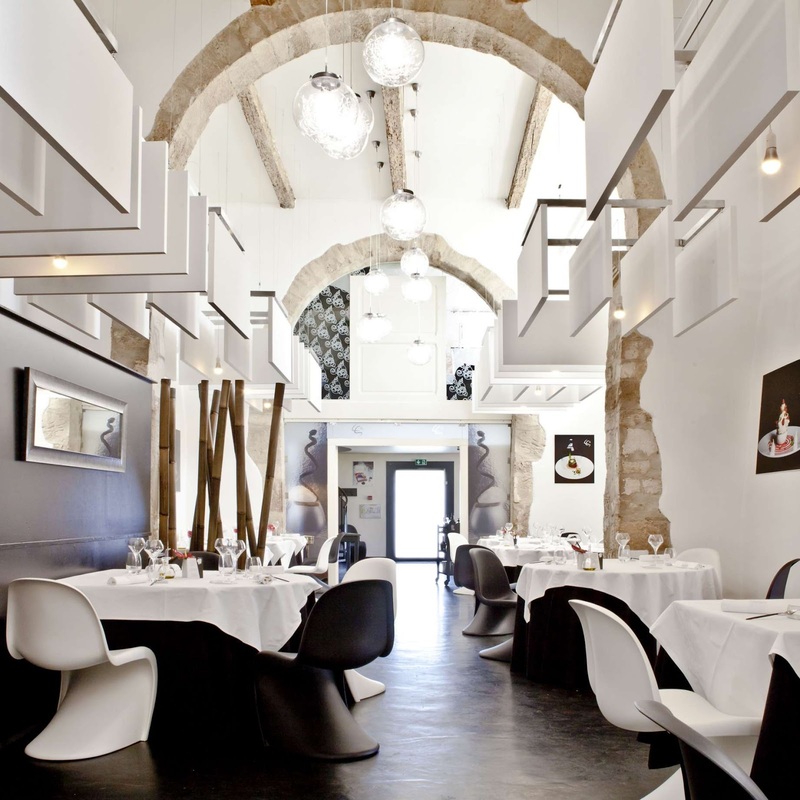 The only restaurant in Narbonne that has been awarded a star by Guide Michelin is La Table de Saint-Crescent where the eminent chef Lionel Giraud resides. As been quite common among the most famous chefs around here the food is inspired by tradition regional food but in a semi-molecular version. This means that you recognize the food you eat as something familiar, but the looks of it is something totally different and the tastes are much more intense than your taste-buds are used to. They serve a very affordable lunch-of-the day and a number of set menus. The most exclusive menu costs around 50 euros, but includes selected wines for every dish. As with most restaurants of this class a visit is much more than just a meal. It is a happening for all your senses. One of the reasons is that the service is relaxed, friendly and professional. We have often noticed that the really high class restaurants in France have a very relaxed relation to their guests, which is something you miss in many other countries. The restaurant is located in the same building as Palais de Vin in Narbonne so it is possible to explore the local wines after the meal if you find something you would like to bring home. Revisited April 2014: This is the fourth time we dine here and the prize has gone up a bit since last time but so has the quality so we feel we have gained anyway. This time it was Easter dinner with friends and we were very satisfied both with the food and the service. They have also put up some noise reduction buffers that was really needed. Now the noise level is very pleasant, which has improved the atmosphere substantially. It is also done in an architecturally acceptable way in the ancient room. Revisited August 2014: We celebrated our 23rd wedding anniversary this time. Food and service were as always perfect. A little complain though - the chairs are very stylish and almost an exact image of the restaurant's logotype, but with a bad back you can not sit through a three hours meal in them. I asked for a cushion to sit on and that was all right. Birthday lunch January 2016: Couldn´t be better. Everything was absolutely perfect and the service was very pleasant. This is one of the places we go to when we like to celebrate something special. It is more than i meal - it is an experience for all senses. Birthday lunch January 2017: Every visit is a surprise and the food gets better every time. The prizes have gone up a little since we were here the first time, but not much. Disappointment January 2019: Today we should have had my wife’s birthday lunch here as we have had a few times before. We made the reservation three weeks ago on Internet and this morning we got a mail that we should confirm that we are coming. We did so. Arriving at the restaurant they said they were overbooked. They offered us to sit in little totally empty boring room next to the toilette upstairs. We off cause refused. The head-waiter was called on and he offered us to eat in the kitchen with the chef. I guess it should be regarded as an honor, but when we looked at that table it was in the actual kitchen with all alarm and smell that goes with it. When we left, they mentioned that they could offer us a free meal later. It will be interesting to see if they remember that. They have our contact details. Interestingly enough - the day after this debacle we got an e-mail from the same computer that asked us to rate our visit - food, service and venue. We however saved the day by having a very good lunch at Le Petit Comptoire. 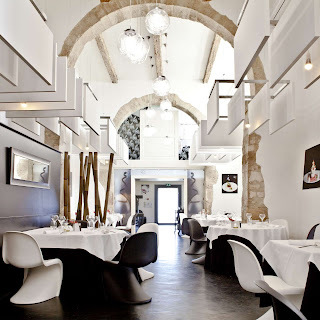 Brasserie CO is a modern restaurant in and old building in the center of Narbonne just opposite to Les Halles. The food is a creative version of traditional dishes served in a modern environment. The service is quick and the place is always packed in lunchtime. The style of the restaurant has a soft “brutalistic” design in different shades of gray and with a certain industrial touch. In line with the business-like style they have free internet even on the outside terrace. This is one of our favorites for lunch in Narbonne. The name "En Face" means on the opposite side and the restaurant has got its name because it is located on the opposite side of Canal de la Robine from the well-known Restaurant L’Estagnol, from which it has its origin. The kitchen is traditionally French with everything that is typical for the region on the menu. They serve both set menus and a selection of salads and other dishes. A small salad, which is enormous, costs 7 euros. They have a good selection of local wines and the house wine of the day is often served in it's bottle that you can drink as much as you like from and pay for what you have consumed. A spectacular desert is Café Gourmand, which is a little bit of everything on the dessert-menu with a cup of espresso. If you order an extra cup of coffee it is enough for two. Revisited in 2013: This used to be our favourite among hop-in unpretentious restaurants, but the three last times we have been there we have been disappointed with both the food and the service. Often we have not got what we expected and the preparation has not been to our liking. Comments on this has been met by arguments from the staff. Brasserie L&L is not a fancy restaurant but we have always got very good food there and the service is friendly and professional. L&L is one of the many restaurants in the port of Gruissan and besides having a good kitchen it is mostly open all year around. We can recommend their grilled fish which always has been very good. As almost every restaurant in this area they serve really good local wine. It might help that they are located across the street from Cave de Gruissan. The restaurant is located on the canal with a very nice view. If you are interested in boats that you cannot afford to buy, this is the place to walk around and envy. You can however rent a monster sailing boat just around the corner if you like. Revisited 2013: As the first summer sun was warm enough we decided to sit outside in end of May. The food was as always good, but the young waitress thought that rush was the same as being professional, this was a bit annoying. She did not have time to listen to our order in a relaxed way. It was not that many people to serve! Revisited November 2015: We have not been here for a while. Today it was 25 degrees Celsius so it was warm to sit in the sun - lovely. But - the food was a disappointment. I love ray so that was my choice. My wife had a Caesar salad - she thought. We have learned that Caesar salads comes in many variations, but one thing is always important - the special dressing. The only sauce here was a few drops of balsamic vinegar. I am tired of chefs who thinks anything turns into gourmet food with a few drops of balsamic. My ray was too ambitious. I like it natural with capers - this was taken off the bones and drowned in sauce. Revisited May 2016: As always the food was good and the service friendly. I had one of my favorites - wing of ray. It was the biggest I have ever had, so I could only finish half of it. We had our coffee on the deck outside and suddenly my wife's chair collapsed. The leg was cut off. She hurt herself but it could have been worse. We would have expected more concern from the restaurant, but they just said they have an insurance and we should tell if she got problems. Revisited July 2016: This was the first time we visited the restaurant in the evening. Very nice and extremely quick service. The food was as always good. Revisited July 2017: A problem for us who live here all year is that some restaurants lower their ambitions in the summer as they think the customers will never return as they are tourists. That might be why the food we were served the other day was everything but acceptable. The good thing was that they did not charge us for the food when we pointed at the bad quality. On the other hand - if I had read my own review from November 2015 I would have known that Caesar sallad and wing of ray was not a good idea. Restaurant Chez Saskia is the winter home and across the street in Jardin de L’Evêque they serve the guests in the summer. Both restaurants are parts of Hôtel de la Cité, which is an extremely costly hotel in the center of the old castle of Carcassonne. 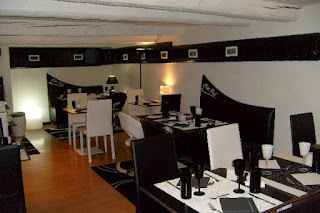 In the hotel you find the Guide Michelin awarded restaurant La Barbacane, which we have never visited. We really like Chez Saskia, a restaurant with a lot of atmosphere with their walls covered with photos of all film stars and royalties that have been dining there. Hôtel de la Cité is the place to stay if you are rich and famous and visit Carcassonne. As quite a lot of films have been shot in Carcassonne through the years there has never been lack of famous people among the guests. Sometimes they might like to relax a bit and Chez Saskia might be the right place to be more anomymous. If you want to enjoy this fantastic atmosphere without spending a fortune you should go to Chez Saskia. Their food is excellent and not expensive. Their lunch menu including wine is not more expensive than in any other restaurant and their fantastic gourmet menu is also affordable. The service is friendly and professional. The traditional restaurant Le Tournedos was started in 1970. It is now run by second generation owners since less than a year. For the locals the restaurant is known for high quality local food served in generous helpings. It is a typical winter restaurant where you can enjoy good food and high quality local wine in front of the enormous grill. Their grilled meat is fantastic. The interior is somewhat booring and still the new owners pretend they have modernized it, but it is hard to notice. The service is, under the new management more custom oriented when it used to be in the old days when it had a certain "no noncense style". If you appreciate really good local food to reasonable prizes, there are few better places to go. Maybe that is the reason why it is mostly packed with people in the restaurant. Le Grand Large is one of our favorites in Balaruc les Bains. This is a place to go for high quality fish and seafood. 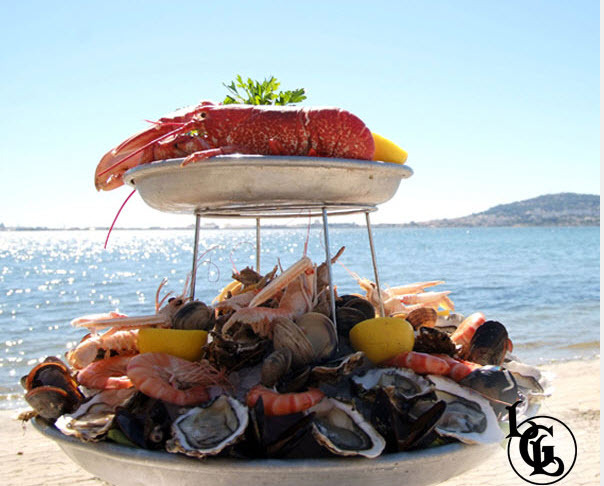 As it is a restaurant of certain style, fantastic food and situated with a view over Bassin de Thau it is a restaurant for special occasions. Do not misunderstand me – it is not expensive, just very good value, nice food, friendly service and a very nice atmosphere. The seafood platters are enormous and the fish is always fresh, but do not hesitate to order meat – it is perfect. My absolute favorite here is beef Carpaccio, which is the absolutely best I have ever eaten. My wife though is very fond of the cutlet fish with a creamy “sauce a la bourride”. The same owner have a twin restaurant next door, Saint Louis, which has a more gourmet style and Le Grand Large is of a more traditional style. Revisited in September 2012: As always very good and not expensive. I again had the fantastic beef carpaccio and this time we all had the traditional dish Bourride de baudroie as main course. It was a fantastic warm and nice day with a nice view over Etang de Thau. Revisited in December 2015: Absolutely delicious. We celebrated that our good friend can walk with crutches after many weeks in a wheel-chair. 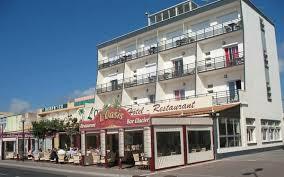 There are a large number of restaurants along the beach-walk in Narbonne Plage. We have come to like the Restaurant Oasis. There are no gourmet restaurants along this walk, but what you need is good affordable food in a restaurant with good service. Oasis is the place where you can get lunch or dinner if you spend your day on the beach. It is just five minutes’ walk from the water to the restaurant and it is open all day so you do not have to eat between 12 and 2 PM as is mostly the case in France. The food is nice, the service friendly and they have a good selection of wine. You can get pizza, salads of the generous French style, fish and meat dishes. They also have a number of set menus and a children’s menu. I often eat their beef Carpaccio that I find nice and just enough for lunch a hot day. Revisited in April 2013: The restaurant seems to be upgraded to meet the summer. New menus, a big selection of new biers from Leffe, more ambition on the dishes and as always good service. An even better place to have something to eat any time of the day at a stay on the beach. Revisited June 2013: It is not pleasant to be disappointed. We have visited Restaurant Oasis more times than any other restaurant in the region. This time we came a little after two in the afternoon and the restaurant was fairly empty. We ordered their second most expensive menu and half a liter of rosé wine. The “moules marinières” my wife got were half freshly made half heated up so most of the mussels were dry and small like peas. The main courses we got were OK, but when we came to the desert the trouble started. My wife does not eat any sweets of medical reasons, but on this menu it said “desert of your choice” and on the dessert menu they had cheese. I did not take any of the more fancy deserts, but was happy with just two scoops of ice-cream without any topping - a very inexpensive choice. The waiter said to my wife that she had to pay 2 euros extra for cheese. The two euros was not a problem in itself, but as we are customers since many years, I took a more inexpensive desert and it said “free choice” on the menu and no notation of any supplement 2 euros, we pointed this out. If it had been any of the regular guys that serve it would not be a problem because they know us well and are always very nice, but this guy had to ask the manager and we know from experience that she is not very interested in service or customers. It is very nice to find new restaurants one likes, but very sad to be badly treated at a place where you thought you were a valued customer. It is also very hard to get new customers, but easy to lose them. With such a terrible summer so far, one could expect that a manager should be keener on keeping the regular customers. Revisited October 2013: This restaurant is still one of the few we know who refuse es to serve non-sweet deserts to diabetics. If you take a menu you can not even pay the difference, which is 1 euro. You have to leave the desert that is offered and pay full prize for cheese. This time however le patron made an exception. Revisited February 2014: It is a new season and we again visit the beach for walks. The last two times we have not been happy with this restaurant. The last time the pizza-bread was very hard and dry and my wife could only eat half of it. The steak haché I had was cold inside. I can eat raw meat, but I ordered medium and I do not like meat that is cold inside and fried on the outside. The big problem is however that the owner never admit anything - she never give you a refund or a compensation or even an excuse. "No-one have ever complained" is her answer to everything. It is a pity because the other two restaurant on the promenade serve totally uneatable food and the service is terrible. We have therefore given this place a heart, but now we take it away. Revisited June 2014: The last few times we have not been happy with the food and not with the service. Still we decided to give the place a chance on the new season. Everything was very good this time. All our food was good and very much improved from earlier times. The place my wife got was big and perfectly cooked. The service was observant and nice. We really hope it is not just a beginning of the season improvement, but is the new trend for the year 2014 and on. Revisited August 2014: It seems the improved quality we saw in June is continuing even in the most hectic week-ends in high season. At our visit a couple of times in August the food has been good and the service very nice. Revisted summer 2017: They have improved their menus. The pizzas are now really good and their meat is always of very high quality. Service has also improved and is now good. It had a dip last year. Revisited July 2018: It is always interesting to come here in the beginning of summer and find out the quality of the year. To often one finds that restaurants has changed to the worse since last year. This is not the case here. The same nice food at a resonable price and good service as ever. Favorites are carpaccio of beef and their bavette, but the sea-food is many peoples favorite. For lovers of oysters and other seafood this is heaven! There are many places along Golfe de Lyon where you can eat seafood and oysters and many places are both exclusive and expensive, but there is no place like the small sheds along the canal in Port Leucate. The oysters are not only the most delicious; the setting is also totally fantastic and really no-nonsense. Along the little canal the producers have built very simple sheds were they serve sea-food and nothing but seafood. You can buy wine and bread, but that is all. Some of the small restaurants just have oysters and mussels, but other have, depending on season, all kind of other exclusive sea-food that you have never seen before. You sit on plastic chairs, you are served on Styrofoam plates and eat on paper plates and everything is just fantastic. We have come to like the restaurant Aquarius that mostly have a good selection, but I am sure that many of the other restaurants in the row are as good. It is fresh, friendly, hectic and not expensive. On sunny week-end the places are packed with people. If you like oysters and sea-food - this is the place. Very rustic, very fresh and very busy on sunny days. Not the least posh, but still the place to go. L’Auberge Côte Jardin is a restaurant what gives me mixed feelings. The ambition of the chef David Prevel is high and he mostly succeeds to serve delicious innovative dishes that are modern variations of the traditional kitchen of the region. One can feel a certain inspiration from the big star in the area Giles Goujon at Fontjoncouse when it comes to choice of products and presentation. Because of the mostly high quality of the food we have visited the restaurant quite a few times. The design of the restaurant is very pleasant with spaces from outdoor to inside depending on the season. On the downside the service is not very professional or pleasant. Sorry to say some of the very young girls they prefer to hire try to compensate their lack of professionalism with a snobby attitude towards the guests, something that is very unusual in gourmet restaurant or any restaurant in south of France. At one occasion we ordered a glass of the very nice house wine and after tasting it we asked what wine it was. “Red”, was the answer. Another time we got a luke-warm bottle of a quite nice white wine. When we complained about the temperature we got a glass with ice cubes to put into the wine. My wife is not allowed to eat sweet desserts and therefore all restaurants exchange the dessert on the set menu with some cheese for her. At this place it was not possible as it was "not included on the set menu". 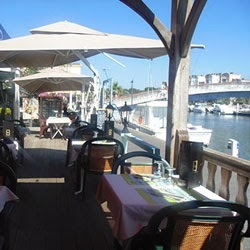 The restaurant is beautifully located on the Canal de Midi. Their speciality is fish but they also serve excellent meat dishes. They offer a number of set menus to surprisingly reasonable prices. The service is very friendly and there is no problem if you have special demands. They are more than ready to alter the set menues to your liking. They have a large selection of local wines to affordable prices. The most expensive menu - Lo Regal - is of seven courses and cost around 50 Euros. It is a lot of exellent food so you have to be very hungry and have a lot of time, Their three course lunch menu is under 20 Euros including a glass of wine and coffee. At our first visit we were a birthday party of six people. The meal started with a taster which was a fluffy foam or rather purée made of fish and herbs. It should be spread on pieces of bread. This was just to warm up our taste buds a bit. Then of course obligatory homemade Foie Gras, which was perfect with unusual accessories as artichoke, sprouts in balsamic vinegar and some other odd thing. Too large portions though. The third dish was a very nice fish in a tomato sauce and tapenade. After the fish we had a tiny little dish to make room in our stomach. It was lemon sorbet with a little Eau de Vie Langedocien. Then came the main course! Half the party had glazed veal liver and the other half had the lamb racks. Both were served with a polenta that was stirred together with cream and grated parmesan cheese to make it lighter than polenta normally is. Both dishes were very good but did not have to be so rich. After this we had the small cheese plate, which contained a series of cheeses with an ash-rolled chèvre, a Tomme, something I forgot, a Camembert, and finally a Roquefort stirred with cream and muscat wine in a brown bread with figs. It should be eaten in that order. After this I was quite full so I thought Café Gourmande should be something little. That was a mistake, but it was fantastic. We washed all this down with white wine from the grapes Rolle and Viogner and a red Saint-Chinian wine from Château Prieuré des Morgues. Revisited 2012 to try the lunch menu: It was excellent as we expected. Revisited July 2013: Excellent food and friendly service as always! Revisited June 2014: Very nice food and perfect and friendly service as usual. My wife's cod had a few parts that were not properly cooked which we told the head-waiter. He compensated us with two glasses of very nice sparkling wine even if we did not asked for any compensation. At this restaurant they are always willing to meet my wife's problem with sugar and sweet fruits. This time they prepared a lovely dessert on fresh kiwi for her. We like this place better and better. Revisited twice in April 2015: Excellent the first time and good the next time. 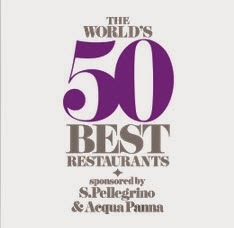 Revisited July 2018: This is always a place that delivers and lives up to expectations. Fantastic set menus and always high gourmet quality to a reasonable price. The service is very friendly and makes you happy even on a bad day. 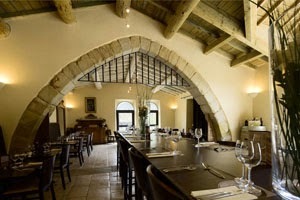 La Table de Fontfroide is located in the ancient Abbaye de Fonfroide. They say the have served food to travelers since the end of the 11th century. It might be a surprise to get inside the restaurant as the entrance looks quite anonymous and the sign Restaurant -Snack, does not promise any culinary experiences. Well inside however an absolutely fabulous room opens up - high ceilings and beautifully renovated. The excellent food is prepared by the young chef Yohan Renard. The service is absolutely perfect, professional and very friendly. They serve both set menus and a la carte. The food is traditional southern French cuisine of highest quality. We have never been disappointed in all the visits we have made to this restaurant. When we at one occasions had some comments on the food we were well compensated and the chef took great interest in our opinions. The restaurant serve only wine of the Abbey´s own production and it is excellent. A choice you have is to include wines on the menus. In those cases you get wines that match every dish in generous glasses. After your meal you can take a lovely walk in the fantastic nature, have a guided tour of the abbey, visit the shop or buy some bottles of wine in the wine shop. Revisited regularly at least once a month on our own or with friends: This is the place we go to most often and we love it. The staff and the chef know us by now and Johan always comes out and chat with us if he has the time. When it comes to time it is quite impressing that one chef, one sous-chef and two young people with no experience in the kitchen can cook for a packed restaurant. When we were there last week it was two coach-loads of people plus a lot of ordinary lunch eaters and despite of the stress, the food and service was absolutely perfect in every detail. On our visit today it was packed as usual. We got a new favorite – it was pigeon baked into a “mille-feuille” with a fantastic sauce on wine. The week before I had their set lunch-menu fish dish as my favorite. It is a cod prepared as “morue”. It reminds of the Portugese bacalao, but I loved this as much as I hate the Portugese dish. It is served with a very fluffy sabayon flavored with horse-radish, which suits my Swedish task perfectly. Revisited October 2013: They have changed their menu, which always is nice. As always the food was excellent and the service very nice. I always try the odd things so I had duck hart for starter, which was delicious, very tender and tasty. My main was cheek of pork made a la boeuf bourguignon with mushrooms. The others had fish which they were very happy with. Revisited March 2014: As always very good. Some dishes are changed since last year. 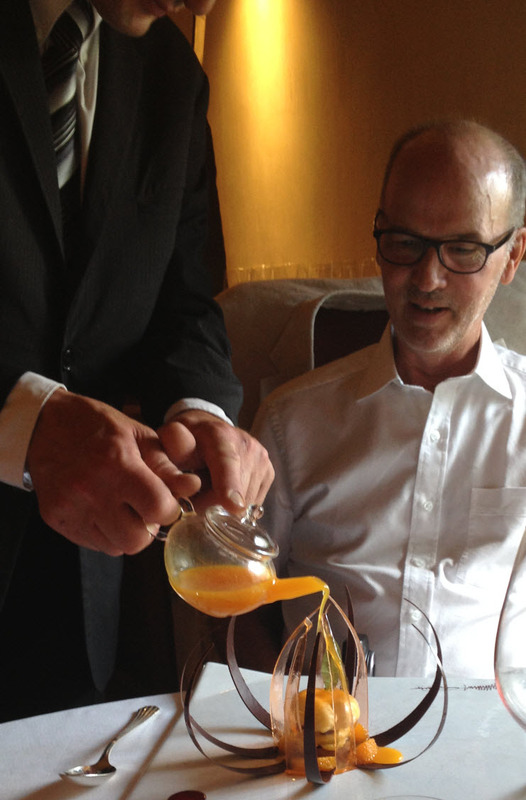 Revisited April 2014: An unforgettable birthday - the chef designed a special birthday-menu for me. Even our French friends who are very picky and are old restaurateurs were absolutely astonished by the quality of the meal. Revisited June 2014: This time we celebrated an 80th birthday. The new menu was very good and it was a very nice experience as usual. One of us had the "baron d'agneu" and was not as happy as the rest of us who had the fish-dish. The new "d'amuse-bouches" on octopus was really good. Revisited March 2015: My birthday and fantastic reception as always. They have new menus and everything we tried were delicious. Revisted March 2015: Another birthday and a specially made lunch of four+ dishes. If you have not had their ravioli with scallops and morels, you have to go back and try it. Revisited May 2015: The verdict from our Swedish friend was - "One of the best meals they ever have had". Revisited July 2015: It was the first day with the new lunch menu, which always is a little special. We tried most of it between the four of us, but not the fish-dish - we'll have that next time. It was delicious - we could not really agree who made the best choices, but we were all happy. Revisited though 2016: It is getting even better. Now they change menu every week. Revisited several times 2017: Splendid. Revisited 2018: It pays to be a regular customer. When we visited the restaurant in the summer for a birthday with Norwegian friends they told us that we should not order from the menu as the chef had composed a special meal for us. Do I have to say it was fantastic. When we just dropped in on a chance the other day we got the last table and ordered the lunch of the day. To our surprise the waiter came with an extra dish that is our favorite with the compliments from the chef. Revisited January-March 2019: We have now had two birthday lunches this year at the restaurant and the chef has composed a special menu for us. It has been absolutely fabulous. What can I say? Affordable gourmet food with the same quality every time. How it is possible to do that with hundreds of eating guests at the same time I can not understand. A real favorite near us there we feel like honored guests every time. Le Parc is one of three restaurants in Carcassonne, which has a Michelin star. According to the guide is Franck Putelat aspirant on another star soon. He has already crowned his career with the prestigious Bocuse d'Or 2003. The restaurant offers a delicious lunch menu based on local products, processed to perfection. The menu we had was mainly based on seafood as squid, sea snails, rock fish, mussels and tuna. Some of the dishes are a bit odd, but surprisingly tasty. One combine meat and fish or seafood in many dishes that is unusual, but very nice. The prices of the wines are reasonable for a restaurant of this class and you can buy wine by the glass and also in half bottles. The restaurant is located at the foot of the ancient fortress of La Cite in Carcassonne, easily accessible. Like most restaurants, which attained a Michelin star, the food may not be described easily. we can however say that there is a difference between one star and three stars, but this restaurant could certainly live up to a higher ranking in the near future. For a restaurant of this class it is very reasonable with a lunch menu for 30 Euros as it was when we visited the place. That is for two for a little over 1oo Euros including wine and coffee and sweets are reasonable. The restaurant is beautifully decorated and the terrace where we sat is airy and pleasant. Service is relaxed and knowledgeable and there is no hint of snobbery on their part. Revisited September 2018: Since last time we were here the restaurant has been rewarded one more Michelin star and they are really worth it. The food is excellent and the service very friendly. It is really amazing that one can eat such fantastic food in a restaurant of this quality for the reasonable prize of 110 euros per couple - including wine and coffee. L'AUBERGE du VIEUX PUITS - 5, Av St Victor 11360 Fontjoncouse. The three-star restaurant L'Auberge du Vieux Puits is located in the small mountain village Fontjoncouse that has a little over 100 inhabitants. You reach the village through the winding mountain roads with stunning scenery. The food is prepared by the eminent chef Gilles Goujon and despite times of crisis, it is difficult to get a table even on an ordinary weekday. They are open both at lunch and at dinner. Their lunch menu Bienvenue au Pays costs 60 euros, their major menu 110 and the chef's surprise menu is 130 euros. The lunch menu is only offered on weekdays. The most honest thing to say about eating at L'Auberge du Vieux Puits is that one gets a dining experience that goes beyond what one gets at all the usual gourmet restaurants we have visited. It is not just a meal but rather a show for all senses. The friendly, relaxed service and the tasteful decor contributes to the total experience. If we compare the perception of the visit a few years ago when the restaurant had two stars, I should say that the food earlier did appeal more to the eye than the palate and in some cases the food was a bit strange with attempts to be a bit artsy fartsy. Now the kitchen, in my opinion, has matured and become more of a harmony between the senses. All dishes are still very beautifully presented but what strikes me is a balance of flavors where one have used an intelligent combination of modern molecualar techniques and the best of traditional country cooking tastes. What was very positive was the unpretencious way they talked about the food. We were told in simple words in French or English, what we were served. No elaborate descriptions that has become so popular among some finer restaurants and that just makes the customer lost and uncertain. As an example, it was served an oyster dish with a ganish of genuine caviar from sturgeon. If it was Russian or Iranian caviar we were not told because it was simply called "fish eggs". On the minus side one has to mention the wine prices. In some cases they add 1000% to open a bottle of wine from a local vineyard. On the other hand the wine is quite affordable from the local producers so the price is still reasonable for a restaurant of this class. A plus is that you can buy selected wines by the glass, which, however, costs 10 Euros/glass. In conclusion one must say it's pretty unique to be able to eat a lunch in a three star restaurant with wine and coffee for about 90 euros per person. Together with friends from Sweden we visited the restaurant to try their set lunch menu. Last time we were there with the same friend we had one of the more expensive menus. As always the visit was more than just a meal. Everything was absolute perfection. Among the remarkable thing we got the second little tasting dish is worth mentioning. It was a lightly poached oyster in a large shells on a bed of very tasty something that we could not identify. In the shell there was a large pearl almost the seize of a Ping-Pong ball that we had to crush with a little hammer and the content poured out on the oyster covered in smoke. I will not say anything more about the food – it was just delicious. Every attempt to describe it in words will just fall flat on the ground. Go there and enjoy! Revisited May 2013 for son's birthday: It is hard to imagine it could be better. For the second time we had bad luck. We thought it was a weekday they served their normal affordable lunch menu, but as this day was between two holidays they only served their more expensive menus. I am actually joking – OK it became twice as expensive as we thought it would be, but both our guests and the food was worth every euro. As always it was more than a meal – it was an experience for all senses. The service is very correct, professional and performed with quite a lot of humor. The food is of course absolutely world class. For every dish we thought it was better than the one before – in the end we could not really decide what we liked best. Besides the small things that opened our senses in the beginning we got a tomato made of sugar and filled with mozzarella accompanied of a lovely gazpacho. This was followed by a combination of fresh white asparagus, a tail of langouste and a lovely newly picket large morels filled with langouste cream –absolutely divine. Next course was a perfectly cooked back of turbot that was inspired by the taste of the Antilles. Finally we had a variation on all parts of suckling goat that was something else. For the first time I tasted goat liver that was fantastic the way it was done here. The cheese trolley was as always magnificent and as it so often is the desserts formed a spectacular finale. Revisited July 2013: Absolutely fantastic as usual! They are beginning to know us now. It does not get better than this. Oh yes - there are eight higher valued restaurants in the entire world, but I can not afford any of those, but this I can - at special occasions. This is the place for celebrations and for a treat. You will never forget it.